Driving game enthusiasts will tell you that racing around the track using a directional pad to steer and a button for the gas and break is not a good substitute for a real race wheel and pedal combination. This handy gaming accessory is the key to winning races and leaving your opponents in the dust. It is a device that can be used in connection with a gaming chair, which will make you feel like you are really in the driver’s seat. Having a wheel like this can easily set you back several hundred dollars, but it is worth the expense to anyone who truly loves racing games. For your consideration, we have created a list that contains three of the best racing wheel options on the market as well as a budget friendly version that will be easier on your pocket. Logitech is a company that has been manufacturing computer accessories and gaming devices for decades, so it is no surprise that such a trusted company would appear on our list for the best racing wheels. The Logitech G920 is a racing wheel that is a great option for any racing game enthusiasts who want a durable device that can be attached to any table or mounted to any racing chair or cockpit. This racing wheel is designed to be compatible with the Playseat Racing Simulation Cockpit, but it can also be connected to other options. 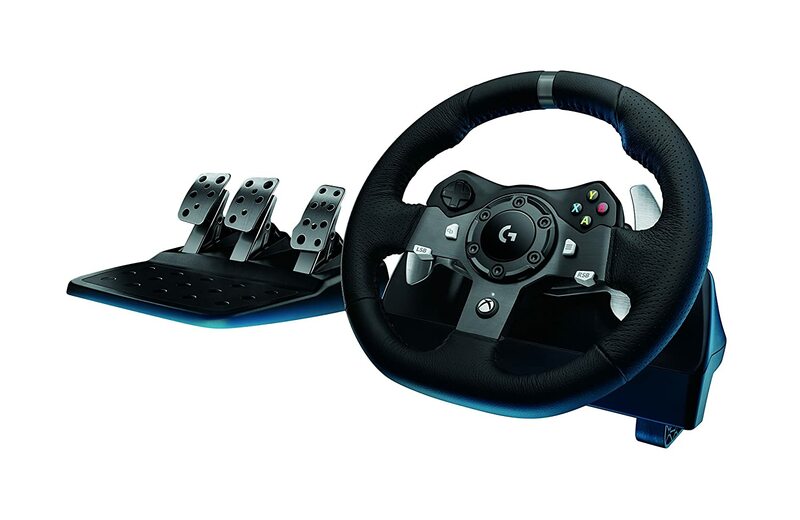 The Logitech G920 is a racing wheel that is designed to be used with racing games on your Xbox One or your computer. The racing wheel has several buttons that can be customized to better fit your play style and your gaming personality. This racing wheel features an Xbox button, a menu button, a view button, a left stick button, and a right stick button. It also features a directional pad and the four buttons that are commonly seen on any Xbox controller, which are the Y, X, A, and B buttons. On the back of the steering wheel, you will also notice that there are two paddle shifters, which are designed to be a semi-automatic method of switching gears. This shifting method is extremely responsive, but if you prefer to shift in the same manner that you would inside of a car, instead of using the shifter paddles, then this racing wheel can be connected to the Driving Force shifter. This manual shifting device emulates a six speed manual shifter that will give you a more realistic driving experience. This is a great way to control your speed and your ability to maneuver around corners without relying on the brake as much as you would need to with an automatic transmission. This racing wheel is designed with sturdy material that will take you the distance you need to go. The wheel features solid steel ball bearings, and the petals are also constructed from stainless steel that will last for years. The wheel is fitted with a hand stitched leather cover, which gives you a level of comfort that most racing wheels fail to provide. There is also a silver stripe on the steering wheel that serves as a visual cue to where the wheel needs to be positioned to go straight. This racing wheel has a 900 degree rotation, which means that you can turn the wheel a full two and a half rotations. The pedals of this racing set are extremely realistic. There is a pedal for the throttle, one for the brake, and a third one for the clutch. They are designed to feel like you are accelerating, braking, or shifting gears in a real car. The base of the foot pedals are fitted with rubber, which is an effective way to ensure that the pedals do not slide when you are attempting to race. These pedals are designed to be extremely responsive, which means that you will have better control of the car you are racing. If the pedals are not comfortable right out of the box, they can be adjusted to more comfortably fit the size of your foot. This racing wheel features a dual motor force feedback that allows you to feel every turn in the road and every bump in the terrain. This means that if you are driving across a gravel pathway, you will know through the vibrations that you are no longer on a smooth paved surface. Even with this type of vibration, you will be able to maintain your lead because of the precision controls that are designed into with this racing wheel. The anti-backlash technology keeps the wheels and the pedals tight to allow you to continue driving in a smooth and controlled manner. Insofar as reviews, 68 percent of the reviews on Amazon have been given a four star rating or higher. Here is an example of a five star review that gives a testimonial for the realism and the reactivity of this racing wheel: “With this set up you might actually forget you’re playing a game and believe you’re driving a real car. This controller brings quite bit of real-world reactivity into the game and that’s what it’s really all about.” The Logitech G920 Racing Wheel can be purchased on Amazon for about $353, which is a reasonable price for such a great racing accessory. Thrustmaster has been an active manufacturer of interactive entertainment since 1984, which means that they have been providing us with durable hardware for our computer and console games for decades. The Thrustmaster VG TX Racing Wheel is a piece of hardware that is designed with racing enthusiasts in mind. It is designed with durable stainless steel material that will provide you with years of racing. It is compatible with PC racing games as well as games that you play on your Xbox One, which means that it can be used for a wide variety of racers. The steering of this racing wheel features a large degree of rotation, which means that you can adjust the steering to feel extremely close to an actual vehicle. It ranges from 270 degrees to 900 degrees, which means that you can have a loose steering option for those games where you are driving a truck, and a tighter steering for small, compact racing cars. The steering wheel is fitted with a hand stitched leather covering that is stylish to look at and comfortable to grip. There is a yellow wheel strip that allows you to visually see exactly when the wheel is straight. 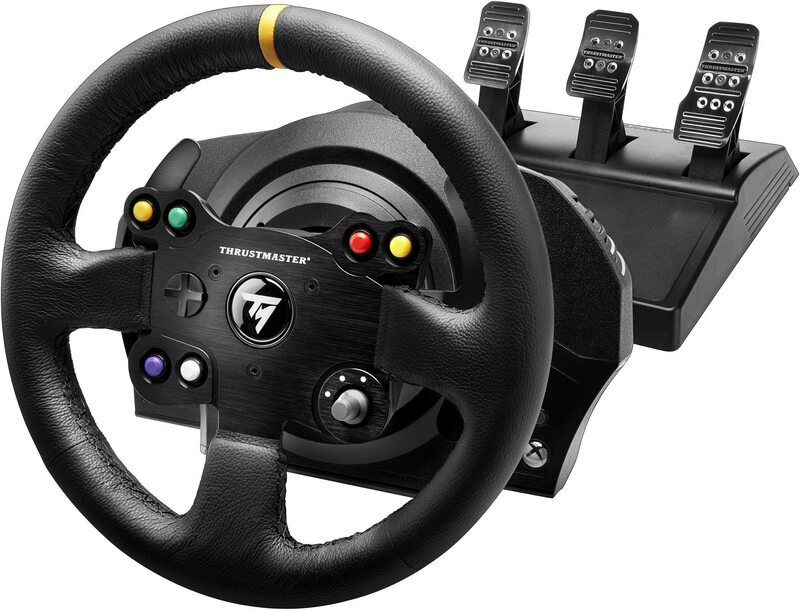 This Thrustmaster racing wheel features a servomotor that is extremely responsive. It provides force feedback for all terrain changes and bumps that you would feel in an actual car. In addition, this racing wheel comes complete with HEART Hall Effect Technology, which is designed to give you accurate precision that will remain intact for years to come. This racing wheel set comes with a three pedal setup, which means it has a gas, a brake, and a clutch. These pedals are designed to be comfortable right out of the box, but if the size of your foot makes it an uncomfortable drive, then the pedals can be adjusted to better accommodate you and give you the comfortable driving experience you desire. 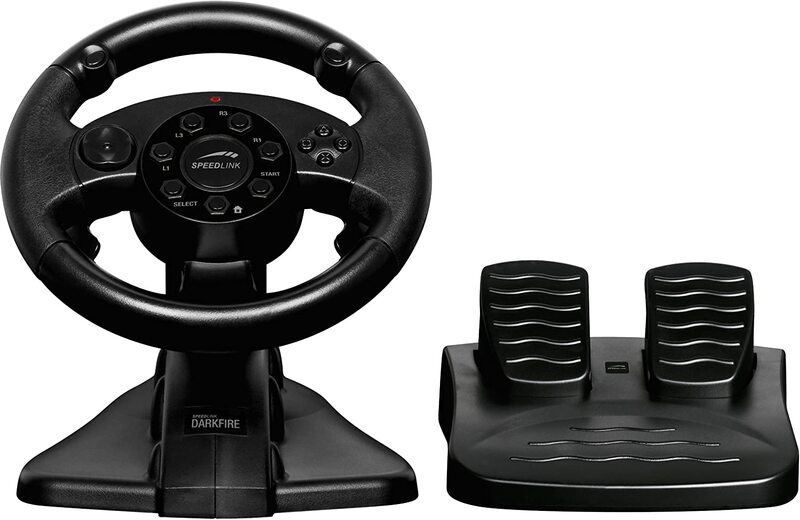 In addition, this Thrustmaster racing wheel can be screwed tightly to any desk or table. It can also connect to many of the cockpit chair options that are available for racing games. The racing wheel features a number of buttons to improve and customize your racing experience. There are six programmable buttons, which add a colorful aspect to the all black racing wheel. They are orange, green, red, yellow, purple, and white, and they can be set to perform any action that you desire. There is a directional pad to easily choose from the menus in the game. There is also a three way tact switch that can be pre-programmed to your liking. In addition, this racing set up is compatible with Xbox Kinect, which means that you can enable the Kinect detection option and use the motion detection during your racing experience. This racing wheel has two paddle shifters on the back side of the steering wheel, but if you desire the feel of actually grabbing the gearshift in your hands to shift, then there are other options available to you. The Thrustmaster TH8A Shifter is a device that is compatible with this racing wheel that will offer you the rugged manual shifting experience that you crave. When it comes to reviews, there are several hundred on Amazon alone. Out of all of the reviews posted there, about 62 percent of them gave this racing wheel a four or a five star rating. Here is an example of a five star testimonial for the Thrustmaster VG TX: “As a Forza5 user I was compelled to replace my Hori wheel to be compatible with Project Cars as well. This wheel is amazing in that it gives you the feeling you are behind the wheel of a high horsepower, high speed vehicle feeling the surface you’re driving over and the impact of accidents.” This racing wheel can be purchased on Amazon for about $469. It is a bit pricey, but you will not regret the purchase once you sample all of the features this racing wheel has to offer. Our bronze pick is also manufactured from the same company as our silver pick. Since we already know that Thrustmaster is a top manufacturer when it comes to gaming hardware and accessories, it makes a lot of sense that they would show up two times on our list of the best racing wheels. Our third place pick on the list is the VG T300RS, which is a racing wheel that is compatible with the Playstation 3 and the Playstation 4. 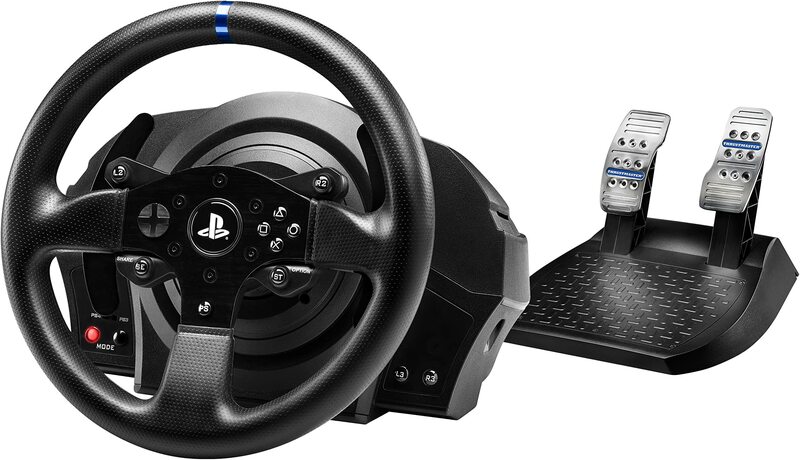 The racing wheel is a completely black design that features a detachable GT style racing wheel. The steering wheel cover is made from a rubber material that is designed to help prevent your hands from slipping when you are racing. On the console, you will see a switch on the left hand side that allows you to switch between the PS3 and the PS4. On the right side of the steering column, you will see a L3 and a R3 button that is completely customizable. The center of the steering wheel has a start button to quickly access menus as well as a share button to share your photo finishes with your friends. Since this is compatible with the Playstation systems, it has buttons that are similar to those found on the dual shock controllers. There is a PS button like you would find on typical Playstation controllers as well as a directional pad. This racing wheel also has a L2 and a R2 button that is conveniently placed in reach of your hands. There is also a triangle button, a square button, a circle button, and a button with an X on it. All of these buttons can be customized to fit your play style. There are also paddle shifters that are extremely responsive, but if you prefer to use an actual shifter, then this racing wheel is compatible with the Thrustmaster TH8A and the Thrustmaster TH8RS. This racing wheel features a wheel rotation that ranges between 270 degrees and 1080 degrees, which means that it will offer you a realistic feeling racing wheel whether you are driving a high speed car or a truck. The racing wheel is designed to be mounted on a table, a desk, or on a cockpit, and it has a fully adjustable pedal setup that can be set to six different positions. There is only a two pedal device that is included with the racing wheel, so if you desire that clutch under your foot, you may need to upgrade the pedal controls. For many individuals the gas and brake style pedal is sufficient. When it comes to force feedback, this racing wheel has a brushless motor that is designed to feel the bumps of the terrain as you go across unpaved ground as well as feel any crashes that you may have. Since it is a Thrustmaster product, it also comes with HEART technology that uses a magnetic sensor to make sure that the precision and the accuracy of your racing game never decreases. On Amazon, 77 percent of all of the reviewers who rated this racing wheel gave it at least a four star rating. Here is an example of a five star testimonial: “This wheel has totally changed my racing experience. I love the feedback and the build quality. The weight of it really makes you feel like you’re handling a car, not just a video game.” This racing wheel can be purchased on Amazon for about $300. Not all race enthusiasts are adults, so parents may want an option that is easier on the wallet than the other racing wheels on our list. Though the Speedlink Darkfire is great for those who are under 18, it is also a great option for adults who may be ballin’ on a budget. This racing wheel does not have all of the frills that some of the more costly ones have, but it is a great option for someone who simply wants to drive instead of pressing buttons to control the game. The Darkfire is compatible with the Playstation 3 and most PC set ups, which means that it can be used with a variety of different games. The racing wheel is designed with a silicone cover that will keep your hands from slipping off of the wheel. It also has four suction cups on the base of the race wheel that is designed to keep it in place while you are racing. This racing wheel is designed with six programmable buttons, which are the triangle button, the circle button, the square button, and the X button. There are also two buttons that are located directly in the top of the steering wheel to give you quick access to your pre-programmed settings. There is also a directional pad, a L1 button, a L3 button, a R1 button, a R3 button, a home button, a start button, and a select button. Shifter paddles are also attached to the steering wheel. The Darkfire racing wheel has a 220 degree rotation. That is designed to make this racing wheel feel more realistic. It comes complete with two force vibration motors that allow you feel yourself driving on the road as well as a pedal set that has both a gas pedal and a brake. The pedals are designed with a nonslip surface that is perfect for preventing your foot from sliding off of the pedal during a tight race. When it comes to the reviews of this racing wheel, there are only a few on Amazon, but six out of the nine individuals who reviewed this racing wheel gave it a four star rating or higher. Here is an example of one of the five star testimonials on the site: “Great wheel for enjoying racing games on the PC. All works perfectly. I was a bit worried that the pedals and wheel would be a lot smaller than other racing wheels, however it’s just a tad bit smaller than some others, so that’s nothing to worry about, and you’ll still get the best racing experience possible with this thing!” This racing wheel can be purchased on Amazon for about $48. If you are looking for a no frills racing wheel for yourself or your kids, then this may be the perfect choice for you to experience racing at home; arcade style. Make sure that the racing wheel you are thinking of purchasing is compatible with the system you want to race on. Not all race wheels are compatible with all consoles; in fact, in most situations you will need a few racing wheels to cover all of your systems. PC racing wheels are typically also compatible with Playstation systems, but not with Xbox systems. Even though it would make more sense for a PC racing wheel to be compatible with the Xbox systems, it is a rare occurrence. Also, make sure that if you purchase the pedals separately from the actual racing wheel that it is actually compatible. If they are made from different manufacturers, they may seem to connect fine, but they will not work when you try to use them together. Steering a racing wheel should seem as realistic as possible, but recreating an actual car steering column can be difficult. Typically, the more you spend on a racing wheel, the more realistic it was manufactured, but that is not always the case. Having at least a 900 degree rotation in the steering will give you more control over the wheel, which means you will be able to maneuver those sharp curves without wiping out. Some people prefer to drive a car with an automatic transmission, while others prefer to take the job of shifting gears into their own hands. Automatic control means that you can focus more on the road ahead and get your speed up on a straightaway, but having manual control means that you can downshift during a turn and time it perfectly to power slide around the corner while remaining in full control of your vehicle. Which driving style do you prefer? Not all racing wheels are created equally. In fact, some are made from cheap plastic materials that will not last through even a little bit of abuse. Others are made from quality material. With theses more durable racing wheels the pedals are often made from medal and will last a long time. Being able to press the brake to the floor hard with some force is a much better experience than being forced to simply tap it because you are afraid the material will not stand up to that type of pressure. Make sure you choose a racing wheel that will not break the first time you need to slam on the breaks. In a real driving situation, bumps, jolts, and vibrations can be felt through the steering column. The same thing should be true of a racing wheel that is being used for gaming, especially when you want it to simulate real driving as closely as it can. Some racing wheels have a motor inside that truly recreates the bumps and vibrations of driving, but others only offer the same level of vibration as a typical gaming controller. Decide how important force feedback is to you before you purchase your next racing wheel. In fact, some advanced racing wheels even have two motors to make you really feel the road you are driving on. Most racing wheels have buttons on the steering wheel itself to make it easier to select your vehicle, shift, power boost, or even fire a weapon. Consider how many buttons you will need to play your favorite racing game before you decide which racing wheel is the best one for you. A good racing wheel will have some of the same types of features that you would look for in a real vehicle, but also some of the features you look for in a good gaming controller. Racing can be an extreme sport or a way to simply spend some time with your friends. If you plan to link up through your gaming chairs, make sure that you find a racing wheel that is compatible with your gaming chair. If you are not sure what to look for in a gaming wheel, take a look at our pre-purchase considerations before making a purchase. A gaming wheel is definitely not a necessity, but it is an accessory that will make playing Need for Speed an epic gaming experience that you can immerse yourself in.